Some of you are aware that I spent my graduate school years researching the topic of why college and university presidents fail. 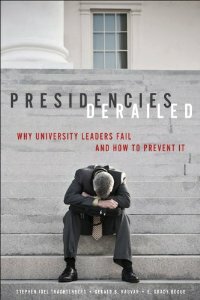 I am pleased to announce that this research culminated in the book, “Presidencies Derailed: Why University Leaders Fail and How To Prevent It,” published by The Johns Hopkins University Press. 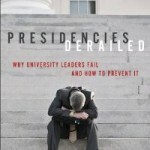 “Presidencies Derailed” is now currently available on amazon.com as a pre-order. Release date is August 1. The bulk of the book is filled with case studies of presidents who were asked to leave prior to completing their 4th year of service. Along with 3 other graduate students, my research analyzed the factors and events that led to these presidential flame-outs and offers insights into how to keep them from happening in the future. An advance review of the book by Jeffrey Gedmin for Huffington Post can be found here. If you have an interest in higher education leadership, I think you’ll find this text an informing read!